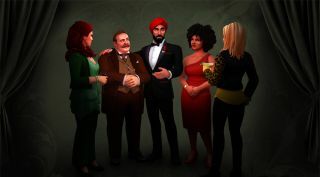 'Asymmetric multiplayer espionage' game SpyParty is getting a bit of love in the form of the Not-Strictly Ballroom update. As the name implies, it relates to the game's ballroom, which has undergone a bit of a graphical overhaul. The graphical upgrade is substantial, as you'll see in the below images. Grab and slide the column in the centre of the images to compare before and after (before is on the left, in case it isn't obvious). Of course, the name of the update also implies that it's not all about ballrooms, and new characters are also being added to the game (we learnt a bit about these back in April). There are six new faces overall, though two are twins, so maybe five and a half faces? Whatever the case, the revamped ballroom now has 16 characters in total, up from 13 previously. It's worth checking out the full update notes on the official website. What is SpyParty, you ask? That's a really good question. Tom Senior said it best all the way back in 2011: "In Spy Party, one player is a spy at a party. It's his job to mingle with the NPC revellers. He must covertly complete a series of objectives within a time limit. These might include a task to steal microfilm from one bookcase and deposit it on another, or a challenge to re-order some statues, or make contact with a secret operative." Work on SpyParty is ongoing.